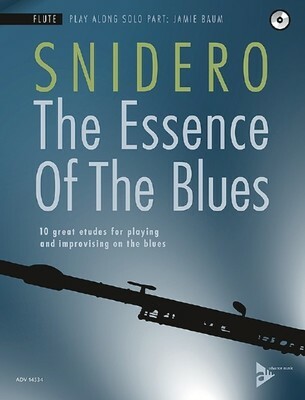 The best-selling Advance author (Jazz Conception) and award-winning saxophonist (2017 Downbeat Critic's Poll) Jim Snidero now presents The Essence Of The Blues, a new attractive method for beginners and moderately advanced players who wish to learn the language of the blues. Each edition contains 10 solo studies which have been transposed and arranged for the principal jazz instruments. The recordings on the professionally produced accompanying CD were performed by top-notch soloists and New York's best swinging rhythm section: Jim Snidero (alto saxophone), Eric Alexander (tenor saxophone), Jeremy Pelt (trumpet), Steve Davis (trombone), Jamie Baum (flute), Mike LeDonne, Peter Washington, Joe Farnsworth (rhythm section). The Essence Of The Blues is suitable for lessons with young pupils in particular but also for self-study or as performance pieces for jazz ensembles. Each piece comes with appropriate scale exercises, tips for studying and practicing, suggestions for own improvisations as well as recommended listening.